Click the button below to add the 100 Series - Interior LED kit to your wish list. Add back up lights for 1998-2005 models? Add back up lights for 2005-2007 models? 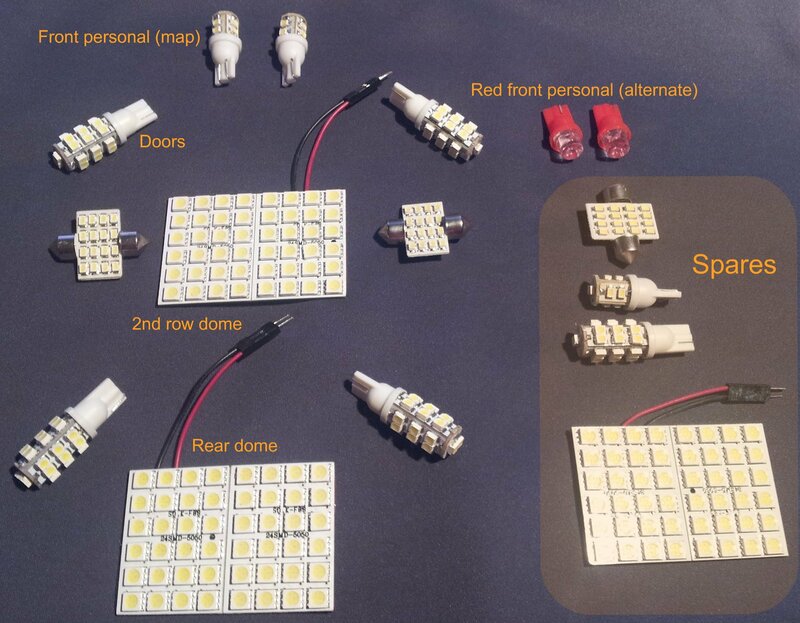 Stellar LED kit for 100 Series! Literally looks like 10 stars are lighting up the interior. Pictures don't do it justice, buy them, install them, and never lose a quarter between the seats ever again. It's better than the 6000k LED at autozone. Easy to install, plug n play. The red map lights are cool but I put white all around. Door man lights eliminate the need for mudlights or side underlight. My only concern is the huge rectangle of LED's does get quite hot but not as bad as the bulbs before. Great Product. I bought after seeing the lights in my friend's 80 series. This kit is amazing. It really brightens up the interior and makes everything nice and clear. The kit is super easy to install and is a great mod for any vehicle. Everything fit where it should. I love these kits and have installed them in many of my vehicles over the years from 100 series, to 80 series and a couple gens of 4runner. You won't be disappointed with this purchase. Easy peasy. The reverse lights are awesome and makes interior visibility so much better. Especially when your kiddos are dropping stuff on the floor. A quality product that needs some instructions for installation. A few of the bulbs could be used in multiple spots and make it confusing. I did get some reverse LED lights. I will review then once the sun sets. With the assistance of an IH8MUD thread the install was painless. Very noticeable upgrade! In the winter I bike at night and this will help a ton being able to see while I'm poking around at the back of the truck due to the increased rear dome light. Awesome kit makes all the difference in the world when trying to locate something in the car, no need for a flashlight! The back up lights are amazing. Super easy to order and install. Great product, it is nice that it comes w spares as one of the door lights didn't work shipped, but thanks to the spare the interior is lit up like christmas. Many people comment about the lack of instructions, a search on ih8mud will get you what you need.